What will happen if Arsenal lose to Chelsea this weekend? a) Arsenal have a new manager. b) The new manager is working to instil a different style and approach in the players from that which has gone before. c) Five new players have been introduced at once to the team. d) Playing two clubs from last season’s top five in the first two games is rather a tough start given points a) b) and c) above. Putting those four points together it is not inconceivable that Arsenal will lose to Chelsea and thus, after a few moments thought, some of the aforementioned columnists will do the maths and realise that Arsenal will have played two and lost two. And in a world in which everyone is to be judged by a) their last tweet and b) the last five minutes, it will be doom, gloom, crisis, disintegration, panic time. Of course it will only be doom, gloom, crisis, disintegration panic time in the minds of journalists and of writers of the bloggettas, but that won’t stop them writing about it. After all hysteria would be their middle name, if they were actually real people and not the imaginations of a bit of machine code. So in the interests of public health, and not wishing to put those who program these articles under too much strain I thought I would help with a bit of background, such as when we the last time Arsenal lost the opening two league matches of a season? It would of course be ideal for the anti-Arsenal-Arsenal if it had happened in Mr Wenger’s time, but it hasn’t – and I have to say that with a bit of luck it won’t happen in Mr Emery’s time either. But oh how they would love to start quoting awful Wenger years. Two tough outfits to play against in Norwich and Blackburn and I am sure people were predicting brilliant long term futures for both clubs. In the end we didn’t get relegated as the pundits were joyfully predicting: the end of Arsenal’s run in the top division since 1919. No, Arsenal came 10th. In 1991/2 however we recovered and came fourth in the League. But just look as those fixtures: QPR, Everton, Villa – tough teams all! Where are they now I wonder? In 1987/8 we came sixth. Which perhaps shows that two defeats and a draw is not the end of the world. But then I wondered what other managers had done at the start of their tenure with the club. But Mr Wenger’s opening is always hard to measure because of the difficulty in knowing exactly when he started with the club. Rioch left in August 1996 and Houston was then appointed temporary manager. Then Vieira and Garde were signed while Arsenal were still not confirming that Mr Wenger was the manager – that didn’t happen until 22 September. He actually started on 1 October. So disentangling from that what his first game was, is tough. I wouldn’t be surprised to be told that Mr Wenger was watching the game on TV in Japan and talking to Arsenal on the phone and saying “bring on Vieira” for his first match. In the end he was not only the manager with the most games at Arsenal but also with the highest ever win percentage (excluding managers who managed for less than one season) at 54%. As for other managers in their opening three games… George Graham started with a win and two defeats. And going right back in time Herbert Chapman opened his Arsenal career by losing to Tottenham at Highbury, but then recovered with a draw and finally a victory in the third game. Actually, I am not too sure that opening matches do tell us very much. But if we do lose to Chelsea it is certain to be doom, gloom, crisis and terminal decline in the media. For a while. After which things will pick up. Why will Arsenal suffer a freeze on increasing its wage bill, as the media suggests? How we can tell there is still something seriously wrong with Premier League refereeing. On Monday 20 August Untold Arsenal will move to a new server and transfer across to Hyper Text Transfer Protocol Secure (https) from the current http protocol. During this process it is possible the site will be down for a while. 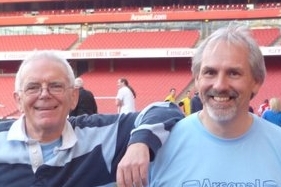 We’ve done this already with our other two blogs (Untold Dylan and Arsenal History Society). One moved with no problems, the other was down for 48 hours. One can only wait and see. If you want to stay in touch during any downtime please follow us on Facebook (https://www.facebook.com/UntoldArsenalToday/) and Twitter (@UntoldArsenal). If the problem seems to be taking a while to resolve we’ll move to publishing on the Arsenal History Society site. Sorry about this: we have no option but to move to https, and we’re hoping the new server will give us yet more security. 10 comments to What will happen if Arsenal lose to Chelsea this weekend? My charge to all Gooners in respect of our away big game in the PL against Chelsea on Saturday is no Gooner should show any anxiety or be worried as to whether the result of the match will be to the favour of Arsenal or not. Let me seize this opportunity on this UA website to assure all Arsenal fans that the Gunners will demolish the Blues at the Bridge on Saturday before their partisan home fans and return to the Emirates Stadium will all the 3 points at stake in the match. Whatever be the game plan and match strategy Sari, the new Chelsea manager will instruct the Blues to execute in the match against the Gunners in the game will not work but utterly resulted into failure to become a none starter game plan and match strategy executed by the Blues in the match against the Gunners in the game. This is so for the simple reason of the fact that Arsenal have been ordained by the PL games Spiritual Ordainers to win the match by beating Chelsea hands down in the game with a number of undisputed goals scored by them against the Blues with no goals scored by the Blues in the game. No doubt, the media will adopt the “Angry Arsenal fans demanding change” narrative, quoting such impeccable source of professional comment such as Mr. Allerdyce. Given all the variables that you mentioned in your preamble, I just want to see progress. Hopefully this means victories but more than likely it will show itself in improved coherence on the pitch. I think the lads will learn the system reasonably quickly but learning what the tendencies of all the new players are is something that takes a lot longer. If we lose, we should, all of us, BOYCOTT clicking on any website talking about the match for, lets say, 24 hours. Heck, 48 hours if you can stand that. Often we read stories and the negative stuff is not in the headlines so we should avoid ALL websites. Since we know, after 15 years or so of experience that the coverage will be overwhelmingly negative, we should see if we can move things with our market power…just a suggestion! The media are only concerned with two things, selling newspapers and TV ratings. Both would love to see Arsenal fail because that would make doom and gloom news. If Arsenal defeat Chelsea, it would mean the Emery regime is slowly starting to prosper and that won’t sell newspapers or improve ratings. Both teams have new coaches. There is no excuse, all things being equal for either team to lose. The team with better quality should shine through to victory. There is however the all things being equal and PGMOL are the critical creators of momentum. There is the case of AMN injury (fractured tibia) which was because of Walkers rash challenge that Oliver chose to ignore. A challenge that was less than 3 meters from the selective visioned assistant. The Arsenal fans were all baying for a foul but nothing was given (apart from the tackle that fractured a young mans tibia). This must be due to ‘Wengers training methods’as per the media. remember when we lost 3-0 at home to coventry in our first game of the 93/94 season, admittedly we went and won at the lane two days later if i recall and we ended up finishing fourth and winning a european trophy that season. Certainly not gonna give up hope even if we lose soundly this weekend! We’ve got a cracking squad this season including some real world class, real team players, once they get going, our rivals are gonna know about it! 1) How will opponents counter the playing out from the back routine and will Emery mix and match his tactics to counter his opponent’s adaptations? 2) How many games will it take for the team chemistry to fall into place and the Wengerball or should I say Emeryball to become apparent and evident? 3) How long will it take for our new players to begin showing their obvious talents? I can attest that Guendouzi, Liechtensteiner and Torreira are already showing glints of the superb form that is to come. 4) How long will it be before we are treated badly by the PIGMOB if we begin to gel and start winning regularly? 5) How much tolerance will the Board and Gazidis display if we stutter over the next series of games? We didn’t lose disgracefully to MC, and had we been a bit sharper in our finishing, a bit more organized in our midfield play and a bit luckier in goal, we might have done much better against them. We know what to do against Chelsea and Emery is clearly the guy to get his players to do it. The first match was a fudge of one team trying to stop the other ‘pressing’ whilst initiating a ‘press’ of their own which was unfamiliar. Defensive mistakes cost us again, particularly the second goal in which Bernard was allowed to stroll unmarked into our area whilst players stood around ball watching. We also missed chances that I would expect to be scored. It was a tentative and unremarkable start against the champions of England and to expect miracles is both unreasonable and unrealistic. This is the beginning of a brand new project and we should all try and ignore the full-spectrum idiots in blogs, newspapers or on the terraces who haven’t the patience or maturity to appreciate the long game Mr Emery and his team are now implementing.